In Tudor England about a third of the population lived in poverty. Their suffering always increased after bad harvests. A shortage of food resulted in higher prices. This meant that poorer families could not afford to buy enough food for their needs. others were mean. This meant that poor people in some villages were fairly well cared for while others died of starvation. for the poor, this created further problems. Unemployed people were sometimes tempted to leave their villages to look for work. This was illegal and people who did this were classified as vagabonds. A law passed in 1536 stated that people caught outside their parish without work were to be punished by being whipped through the streets. For a second offence the vagabond was to lose part of an ear. If a vagabond was caught a third time he or she was executed. the poor. Edward VI set an example by giving permission for Bridewell Palace in London to be used as a workhouse. In exchange for food and shelter, the people who lived in the workhouse worked without wages. If people without work refused to go to the workhouse they were to be treated as vagabonds. To pay for these workhouses, vicars were given permission to ask everyone in the parish to give money. If people refused, the vicar had to report them to his bishop. Workhouses did not solve the problem. It has been estimated that in 1570 about 10% of the population were still wandering around the country looking for work. goods that they produced, the parish gave them money. In this way, the poor could continue living in their own homes. This new law also introduced fines for those who refused to pay money to help the poor. This was followed in 1601 by another Poor Law. Workhouses now had to be provided for people who were too old or ill to work. People who refused to contribute money to help the poor could now be sent to prison. (Source A) In 1594 William Lambarde made a speech about poverty in England. There were always poor lepers, aged poor, sick poor, poor widows, poor orphans, and such like, but poor soldiers were either rarely or never heard of till now... They lead their lives in begging and end them by hanging... They fight our wars... enduring cold and hunger when we live at ease, lying in the open field when we are in our beds. It was obvious to all men that beggars and thieves were everywhere. And we found the cause was that they were idle; and the cure must be to make them work... by providing work ourselves, so that the strong and sturdy vagabond may be made to earn his living. For this we need a house of work... And so, we ask for the king's house of Bridewell. Gentleman and Beggar. 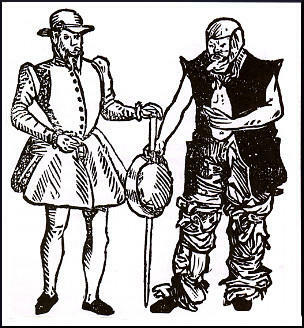 Jennings, a vagabond, was executed in 1566. (Source D) Law passed by Parliament in 1576. So that youth may be accustomed and brought up in labour and work, and so they do not grow to be idle rogues... it is ordered... that in every city and town within this realm a large stock of wool, hemp, flax, iron... shall be provided. (Source E) Report on a survey carried out in Norwich in 1571. Many of the citizens were annoyed that the city was so full with poor people, both men, women and children, to the number of 2,300 persons, who went from door to door begging, pretending they wanted work, but did very little. 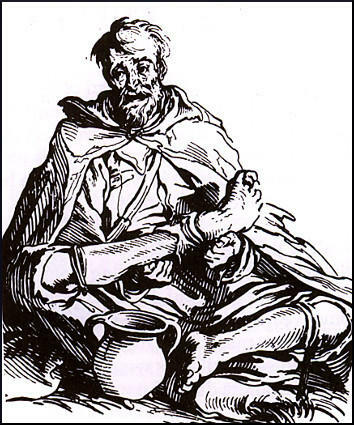 Every vagabond or beggar... shall be stripped naked from the middle upwards and publicly whipped until his or her body be bloody, and forth with sent to the parish where he was born... If any vagabond or beggar return again, he shall suffer death by hanging. Question 1. Source C shows two pictures of Nicholas Jennings. What does this woodcut tell us about Jennings? Question 2. What types of people suffered from poverty in Tudor England? Question 3. Describe the different ways that the English government attempted to deal with the problem of vagabonds. Question 4. In 1550 Parliament passed a law stating that every parish had to build a workhouse. Study sources A, E and F. How useful are these sources to a historian trying to discover if these laws brought an end to the problem of vagabonds in England? Question 5. Study sources B, D and G. Describe the ideas and attitudes of the people who produced these sources.